Most universal Weni Co2 laser for cutting metals, stainless steel , aluminium, non-metal materials and others. WS-CM Series – cutting metal function. It is characterized by an full enclosed cover available in three sizes , a special cutting head with “Metal & Non Metal” and with highly precise and durable servo drive . WS-CM Series is designed mainly for cutting non-metallic materials and metal up to a thickness of 1. 5 mm.It is the most comprehensive and universal laser on the market in the Co2 offer.Laser allows you to cut carbon and stainless steel with high precision by using dynamic auto focus sensor placed in head, which maintains a constant distance of ~1mm to the workpiece material in real mode. WS-CM- series is also equipped in standard with a through table of a knife type with an additional adapter of a honeycomb type, Wi-Fi controller, laser marker of a “Red Cross” type and professional cooling system. Application of the so-called rotary attachment (spindle), spatial solids such as bottles, mugs, cans can be processed. WS-CM series lasers may be additionally equipped with a lifted table. Big display window and backlit by LED’s working area makes it easier to observe the operation of the device. fessional software and reliable Ruida controllers. Metal&Non Metal cutting head with auto focus. A special type of head that allows you to cut metal (carbon steel, stainless steel). durable screw drive. 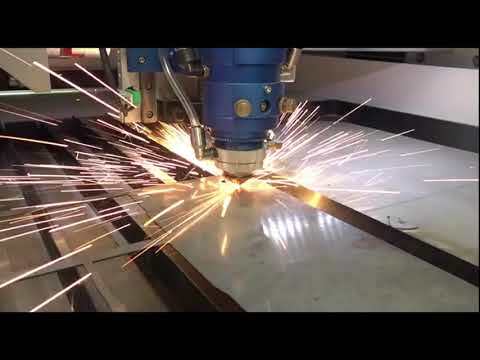 The head creates perfect laser cutting every time, even on hardened and solid stainless steel. Complex contours, small holes and narrow firings are precise and accurate. Ruida controller is the main sub-assembly, controlling the operation of the whole device. It ensures stable operation and broad configuration options of Weni lasers, such as adding in option: rotating adapter, auto focus function, CCD system for cutting by contour, Wi-Fi communication and others. The controller enables, in a basic scope, to operate the laser without the use of software, where a given design may be directly imported from FLASH/USB disc. Weni lasers are equipped with two working tables as a standard, one, the so called „knife” and the “honeycomb”one. The knife table is used for cutting big, rigid elements, whereas the honeycomb one is ideal for processing small, elastic materials which must stay on the table in a specific position after cutting.